People make mistakes. Our actions affect the ones we love. When Savannah makes a decision that will change her life forever, she risks losing the love of her life. By not telling Jeremy, the guilt is eating Savannah alive. When Savannah can’t handle the guilt any longer, she breaks up with Jeremy and tells yet another lie. After being “just friends” for the past seven years, both Jeremy and Savannah are miserable. They're still in love with each other, but neither are willing to put their hearts on the line again. Savannah knows that she can’t have a future with Jeremy unless she tells him the truth. But rather than risk losing Jeremy as a friend, she decides to stay silent for fear of losing him from her life all together. Can Savannah let go of the past in order to have a future with Jeremy? Jeremy won’t take no for an answer when he undoubtedly knows that his heart belongs to Savannah. It’s funny how we punish ourselves just to protect the ones we love. Savannah knows that when she tells Jeremy what she has been keeping from him all these years, he will hate her. Jeremy is tired of the games that he and Savannah are playing. Jeremy decides to take the bull by the horns, because he is tired of living a mediocre life without Savannah. Jeremy wants the one that he loves. The one that completes his life. It has always been Savannah. It has always been Jeremy for Savannah. No other man can come close to the feelings that she feels for Jeremy. He holds her heart, he always has. Jeremy vows to show Savannah that they are meant to be with each other, and he will stop at nothing until he proves it to her. Jeremy could see the pain in Savannah’s face and the scars in her eyes whenever he mentioned building a future together. When Savannah tells Jeremy what she has been keeping from him all these years, she broke Jeremy’s heart all over again. Jeremy knew Savannah had let him down before, but never like this. He never imagined the reason behind all of Savannah’s fears, would tear them apart. Are all mistakes forgivable? When you hurt the one you love the most, is he expected to forgive you simply because he loves you? People say love conquers all, but can Jeremy’s love for Savannah get them through this. Can Jeremy forgive Savannah again for breaking his heart? Can one lie ruin their relationship? Can Jeremy ever trust Savannah again? Does Savannah deserve another chance. Savannah will always be the one for Jeremy. She will always be the one he pictures his future with. Jeremy will always love Savannah. She will always be the one that holds his heart, his love, his future. But can they get past this? Can they both forgive each other for the decisions that were made? 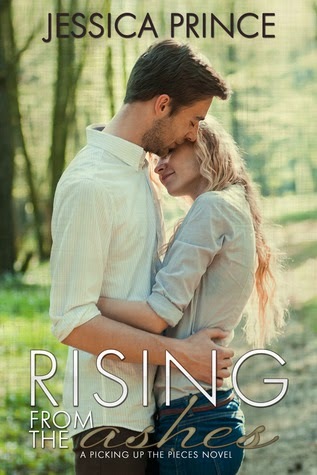 While reading Rising From the Ashes, I have to say, my heart broke for both Jeremy and Savannah. I understood why Savannah did what she did. I am not saying I agree with it, but seeing the situation, she did what she thought was best for “her”. To see the heartache that Jeremy was feeling, tore me to shreds. I loved Jeremy. He didn’t deserve to go through this. He deserved his happily ever after. Jeremy just needed to decide if Savannah was his happily ever after. Sometimes we need to hit rock bottom, lose it all, before we realize that what we want has been standing in front of us the entire time. Savannah needed to hit rock bottom and burn, before she could rise from the ashes. She needed to heal from the demons of her past before she could move forward with the future that she deserved. Guilt eats people alive, and that is exactly what it did to Savannah. Rising From The Ashes is the second book in this series. I enjoyed this book just as much as I did Picking Up The Pieces. I enjoy getting to know this group more with each novel that is released. When I heard this song, it screamed Jeremy and Savannah. Since Jeremy is HOT, and in a band, I could so picture Jeremy singing this song to Savannah. I listened to this song on repeat over and over, so I could actually find the words to put in my review. Jeremy left a lasting impression on me.